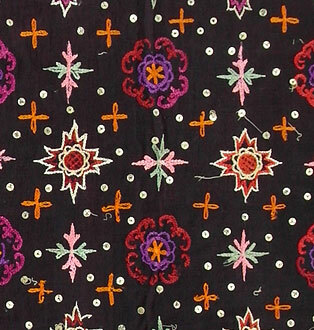 Textiles employing the needlework techniques of couching, embroidery, applique and lace are widespread throughout the Indonesian archipelago and the East Indies Museum has numerous examples in the collection. Couching is the process of laying threads over a ground fabric and attaching them with another thread. Applique is a technique in which pieces of fabric, embroidery or other materials are sewn onto another piece of fabric to create designs. Most of the textiles in this gallery are from the western and southern areas of Sumatra but there are also items from Java and other islands including many pieces that are of Straits Chinese origin.